After their absolutely grandiose debut "Post Mortem Blues" the Italiens finest in heavy doom rock The Ossuary present their second album. The band's convincing performance on their first tour encouraged me to release their second album on Supreme Chaos Records as well. Are you feeling like us and missing the authentic, earthy power of classic heavy rock? That heavy rock, which even reveals a certain closeness to the prog in the true sense of the word and the fresh wildness of the first metal bands of the 70s, when the term heavy metal didn't even exist yet? If so, THE OSSUARY is exactly your sound! Now we are again surrounded by the wonderful-modern smell of the past, and also the first dust clouds are trickling again - because THE OSSUARY are back! The second album is called "Southern Funeral" and puts another scoop on top: more drive, more melancholy and just more of everything! Lean back, close your eyes and just enjoy! Available as exclusive splatter vinyl version limited to 100 copies only available at the SCR mailorder! The LP comes in a heavy gatefold cover and as 180g vinyl, hand-numbered with text sheet. The first edition of the CD comes as DigiPak with 12-page booklet. With „Grenzgaenger“ and the appendant „Pavor Nocturnus“ AGRYPNIE are releasing their most challenging project so far. With almost two and a half hours of music and involving guests like J.J. from Harakiri For The Sky, Eviga from Dornenreich or Marcel from Nocte Obducta are testifying the enormous dimensions of this opus. Yet unheard sounds from AGRYPNIE are merging to a homogeneous creation with raging moments but also sluggish elegiac tracks or entirely orchestral reinterpretations. Just to suit the extent of this release both albums will be available as box edition containing high quality vinyl, a hardcover media book and a lot of extras. The album will be relased October 12th 2018 via Supreme Chaos Records. 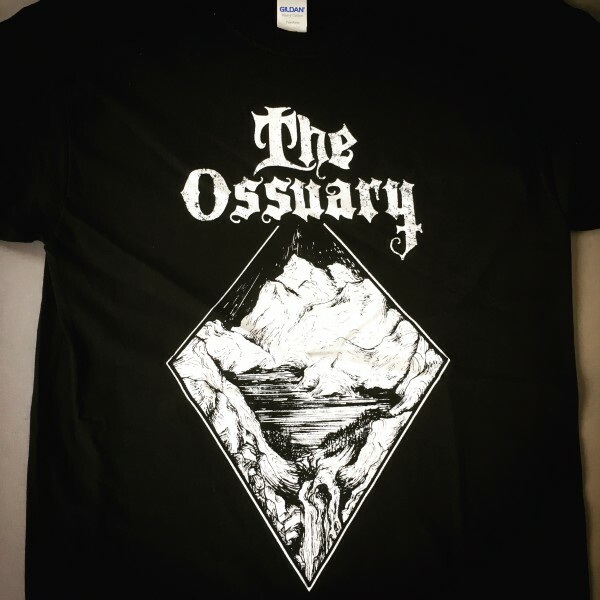 New shirts for the currently running "Post Mortem Tour" from THE OSSUARY have arrived. They carry the great WAEIK artwork of the tour flyers and simply the logo - clean and neat. You can order the shirts HERE or simply buy them on tour (starting September 22nd on the show in Ibbenbüren)! Success! The The Ossuary tour with Satori Junk is fully booked! We are really, really happy to bring those Italian maniacs to all over Europe. These guys really live their music and deserve your full support! Every evening will give you nothing less but heavy doom / stoner rock at its finest! We would be really happy if you attend any of the shows and / or share the tour poster to help us make these shows great evenings for everyone! With the departure for the European tour in October, AGRYPNIE will release two new albums entitled "Grenzgænger" and "Pavor Nocturnus". Mastermind Torsten states: "There are no words to describe the feeling to finally share the details of the two new Releases "Grenzgænger" and "Pavor Nocturnus". Without any doubt no other Releases in the history of Agrypnie was accompanied with such an huge amount of work and even some failures. Sometimes during the work for these albums I had this serious feeling, these releases will never see the light of this world. But it´s FINALLY done and I don´t have any words how proud I am. "Grenzgænger" is so far the most personal Release I have ever written. In the last years I had to deal with the most darkest hours and personal demons. A lot of them are bond into this album. On the other hand, I went through all this mess and made it. This is an important part of this Release as well." Both albums will be available in a heavy box version with two double vinyl records, a 2 CD mediabook, big poster flag and 8 special postcard sized art prints. Of course you can still get the albums separately as double vinyl in gatefold cover, digipak CD or as mediabook. Preorder will start August 14th 8pm CEST (a.k.a. today). EARTH FLIGHT publish music video for "Mirai"
Earth Flight release another excerpt from their new album "riverdragons & elephant dreams" out on Supreme Chaos Records. In many reviews the song Mirai is used as reference for the atmosphere of the album. The records have arrived from the manufacturing company / Lifeforce Records already today! We will start ship the records mid of February 2018. First the handnumbered stickers have to be added. The record comes with download code! The ANCST records can be pre-ordered in our shop. The prog rockers EARTH FLIGHT become part of the Supreme Chaos Records family! The guys have been working so long on the successor of "Blue Hour Confessions" that it almost feels like eternity. Something really big is coming! We have been waiting months to finally release this wonderful album for the rest of the world. All I can say for now: This is totally amazing songwriting combined with grand superior vocals that gives a very own note to all the songs. Listening to this record you have the feeling that the complex multilayered songs are incessantly scratching the throne of the genre tycoons. There will be more details on the album soon. First I am happy to have EARTH FLIGHT on the label! To celebrate this signing, also perfectly for the coming feasts, we have thought about what to give you guys as a gift and raise your interest on the band. Here is what we have got: the gatefold LP version of the last album "Blue Hour Confessions" is on sale for crazy EUR 9,90 only now in our shop, you can pick the CD version for only EUR 8,90. So save your copy! Only as long as stock lasts! With "Ghosts Of The Timeless Void" finally the Berlin based collective ANCST will release a full album again. The album will be released by Lifeforce Records who kindly offered us an exclusive version in beautiful transparent red/black marbled vinyl. These 100 copies will be only on sale through our mailorder. Two mile stones in the band history of Denmarks death metal figurehead ILLDISPOSED will be finally available on wax. "Submit" and "There's Something Rotten... In The State Of Denmark" are currently in production. Both records will be issued on 180g vinyl with heavy cover, download codes plus our infamous "I❤Vinyl"-Sticker. There will be different limited colors which will fit to the artwork of the respective album. You can get your hands on these amazing beautiful records in our Shop.